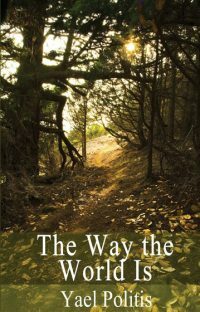 Book 2 of the Olivia series – The Way the World Is – will be FREE on Amazon.com for 5 days. Book 1 of the series is always free, so even if you’ve already read the series, you might want to suggest to your friends that they download both. No Kindle? Don’t worry. Amazon provides free Reading Apps for phones, iPads, etc. Just go to Amazon and click the orange Free Reading Apps link in the toolbar. You’ll be given choices of where to download the app or you can simply enter your phone number or phone or device’s email address to have the app delivered to your phone or device. From the woods came loud cracks of breaking twigs and branches. Someone or something was charging past Mourning, sacrificing stealth for speed. But Mourning couldn’t see who or what it was. Kip? No. He couldn’t possibly be moving that fast. Mourning turned to look behind him, but saw no one. He sat motionless, unable to think what to do. He was jarred out of his paralysis by another shot, this one coming from farther ahead, around the bend. It was followed by a second shot, but still he hesitated. Turn and run? Charge ahead, weapon drawn? Return to the woods and hide? A tall, thin figure walked around the bend. It was Lester. He had a holstered pistol on each hip and was carrying a rifle, but held it high over his head, as a sign that he came in peace. “I’m no danger to you,” Lester said. “I’m going to get my horse. Wait for me, if you care to.” He didn’t pause for an answer and turned off the road onto a trail. Mourning’s gaze followed Lester, who looked absurdly tidy in his coat and vest, his graying hair cropped close, and his beard carefully trimmed. He did not look like a man who’d spent his day running through the woods and murdering people. Lester soon returned, leading his horse. Mourning had not noticed before what a beautiful animal it was, shiny black with white stockings. Stopping next to Mourning, who had not moved, Lester mounted the horse and flicked its reins. That’s what I see in this face. My guess would be that he had either been through an ordeal or was speaking with compassion about someone else who had. This man was a loving husband and father, a good neighbor and employee, and an excellent administrator, well-respected for his efficiency and high work ethic. His interviewer quoted him as saying, “. . . my profession. I enjoyed it. It fulfilled me. 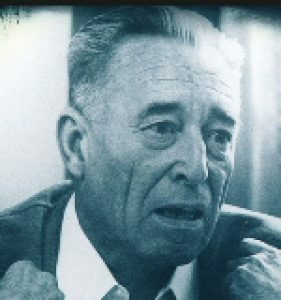 And yes, I was ambitious about that, I won’t deny it.” His name is Franz Stangl and his profession was the efficient murder of large numbers of human beings. He was the first commandant of the Sobibor extermination camp, where 100,000 Jews were murdered under his command. He had proved himself to be so good at his job that he was ordered to take over at Treblinka, where mountains of “unprocessed” corpses were piling up under its previous “incompetent command.” He quickly solved that problem and then supervised the building of larger gas chambers, capable of murdering 12,000-15,000 people every day. His beginnings were more modest: He was a mere Police Superintendent at the Hartheim and Bernberg Euthanasia Centers. These facilities were part of Aktion T4, an involuntary euthanasia program under which the Third Reich exterminated more than 300,000 physically and mentally disabled Germans. This program to eliminate all “life unworthy of life” began with the German Interior Ministry requiring doctors to register all newborns born with Down syndrome, deformities, or epilepsy. These children were removed to special “clinics” where most of them were killed by lethal injection. Some were starved to death. By the time Stangl began serving as Police Superintendent at the Euthanasia Centers, the “patients,” children and adults, were all gassed to death. One thing you wouldn’t have seen on Stangl’s face is remorse. At least not at the time this photo was taken, while he was being interviewed by Czech journalist, Gitta Sereny. 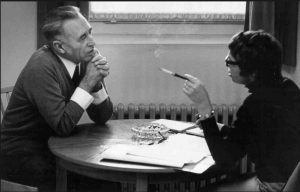 After Stangl was captured and brought to justice, Ms. Sereny visited him in his prison cell and asked him a question: would he be willing, together with her, to attempt to discover how an ordinary man like him had come to participate in the mass murder of millions of human beings? How could such a man grow accustomed to the killings and see the arriving prisoners not as human beings, but as “units” or “cargo” that must be destroyed? As he said, “I sometimes stood on the wall and saw them in the ‘tube’ — they were naked, packed together, running, being driven with whips . . .” The results of the 80-some hours Ms. Sereny spent interviewing Stangl are in her book, Into that Darkness. 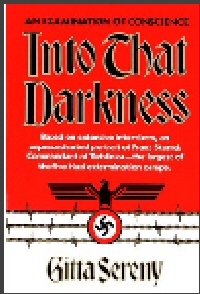 If I could read only one book about the Holocaust, it would be this one. I often think of Stangl in contrast to Oscar Schindler, the hero of Schindler’s List. Oscar Schindler was not nearly as “nice” a man as Franz Stangl. Schindler drank, gambled, womanized, and went to Poland with the express purpose of getting rich by exploiting the slave labor he knew was available there. How did these two men end so differently: the “good” one bearing guilt for the murder of hundreds of thousands and the more apparently flawed one bankrupting himself and going to heroic lengths to save over a thousand lives? My best guess: Stangl fit well into the killing machine because his vision was able to block out the people. He didn’t see individuals, human faces. All he saw was a mass of unacceptables that must be destroyed. Schindler could not do this. He tried his best to take personal advantage of a system that profited by working people to death, but in the end couldn’t bring himself to do so. He couldn’t help looking into their faces, seeing them as valued individuals. What I want to say next is NOT meant to compare any political party to the Nazis. Not at all. We are many, many light years from that. But I can’t help thinking: What, after all, was Nazism, if not identity politics taken to its farthest possible extreme? And more food for thought. I am pro-choice, but the murder of newborn German children with Down syndrome – I can’t help asking myself if that is so different from eradicating these “unworthy” children in the womb, as Sweden celebrates having done. I would never judge an individual woman for making that painful decision – but for that to be a matter of national policy? That I can’t help but see as horrifying. I should be ashamed to admit that I only recently discovered this author when one of his books (Follow the River) and then another (The Sign-Talker) were discounted and advertised on BookBub. 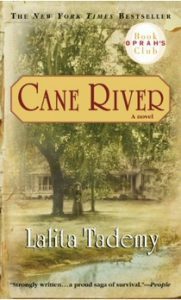 I look forward to reading more, despite how demoralizing an experience that is for an author of historical fiction who is not named James Alexander Thom. Never mind the amount of research this man does – that could easily result in a stunningly boring book. But in Thom’s fictionalized novels he uses that research to put you so deeply inside his character’s experiences and mindset that there’s no avoiding the cliché – he makes you feel as if you were there. 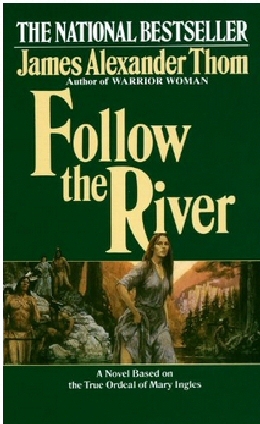 Follow the River depicts the true story of Mary Ingles, who was captured by Indians during an attack on her settlement, escaped months later, and walked home through a thousand miles of wilderness. The Sign-Talker tells the true story of half-Shawnee, half-French George Drouillard, who was hired by Lewis and Clark as hunter/guide/interpreter for their expedition. I’ve read two history books about the Lewis and Clark expedition and can’t claim to remember much about any of the characters involved. This book is different – I will not forget Drouillard or the images of Merriwether Lewis, William Clark, and many other members of the expedition and the tribes of Native Americans they met, as seen through Drouillard’s eyes. When Tonia went down to throw out the trash one evening, she saw Rina standing on the other side of the street, whispering with Shai, one of the older neighborhood boys. She had just opened her mouth to shout “Rina has a boyfriend!” when Shai pointed at her. She tossed the garbage in the bin and skipped over to join them. “She”s too little,” Rina said. “My mother would kill me if we got caught.” “So we won”t get caught.” “Won”t get caught doing what?” Tonia asked. “Putting–” “Shut up, Shai.” Rina poked his arm. “I told you, she”s too young. They think I”m too young.” “She can go last; all she has to do is smooth them out. Even if they catch her, she won”t be carrying anything, so what”s the big deal?” “If who catches me?” Tonia asked loudly. “Shhh,” Rina hushed her. “You”re going to get us in trouble.” “If you don”t tell me, I”ll go tell that there”s something to tell.” “I told you, she”s a little brat,” Rina said. “You wouldn”t really tell, would you?” Shai said. “You don”t look like a shtinker to me.” “I”m not a shtinker, I was just saying that. You can ask Rina. I”ve never told on her for anything,” Tonia said. Not that she cared what Shai thought about her. The other young girls seemed to think he was good-looking with his wavy blond hair, but Tonia thought he was stuck-up and in love with himself. Rina conceded that she had never been a tattletale. “We”ve got to get somebody,” Shai said. “Elboim is sick, and the stuff is already waiting.” That evening Tonia went to work for the Haganah, the underground Jewish army, something she found very exciting. She was going to help Shai and Rina plaster the surrounding neighborhoods with the notices they put up in lieu of a newspaper. Once a week someone left a note underneath a rock outside Shai”s building. It told him where he would find a can, a brush, a list of locations, and a roll of posters. This time they had been hidden behind the garbage bin. “Any car on the street at night is most likely British,” Rina warned her. “So if you see headlights, duck into the nearest building. Go up two flights. If anyone comes in after you, turn around and pretend to be on your way down.” “What do they do to you if they catch you?” Tonia asked. “Nothing too terrible. Sometimes they hit the guys – you know, slap them – trying to make them tell who gave them the posters. That”s why Shai gets a note like that, so we won”t know where the posters came from. But I never heard of them hitting a girl. And they”re not going to hit someone like you, only eleven years old, so don”t worry.” “Is that all?” “Well, sometimes they drive kids far away and let them out of the car in the middle of nowhere.” “Together?” “Yeah.” “Okay. I can do that,” she said and hugged her sister. This was exciting. Once in a while Rina turned out to be all right. As soon as it grew dark, the three of them set out. Shai went first. He carried the brush and the can, in which he had mixed up a paste of flour and water. He stopped, slopped a large circle of paste on the telephone pole at the corner of Allenby and Pinsker, and ran off. Rina was close enough behind him to be able to see where he had put the paste, but far enough away to be able to flee in a different direction if she had to. She had the most dangerous job, carrying the roll of incriminating posters under her arm. She ran ahead, peeled one off the roll, slapped it onto the wet circle of paste, and then continued running. Tonia”s job was to follow behind Rina and smooth the paper out, making sure it stuck. She was supposed to look like an innocent passerby who had done nothing but stop to read it. When Tonia saw where Shai had slapped the paste for the next one, she got angry. She put her thumb and forefinger in either side of her mouth and let out a blast, imitating what Rina thought was her secret whistle. Shai ducked into a building, and Tonia did exactly what they had warned her not to do – she followed him. When she caught up with him, she began to scold. 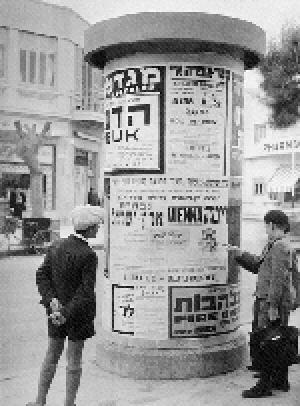 “You put it right on top of an Irgun poster,” she said, out of breath, referring to another underground Jewish organization that was more militant than the Haganah. “That”s what we”re supposed to do, stupid,” he said. “What”s the matter?” Rina came up behind them. 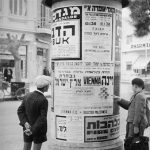 “Your bratty little sister has to learn to do as she”s told.” “He covered up the Irgun poster,” she said, turning toward Rina. “That”s not right.” “You know what Abba says about them. They”re a bunch of criminals.” “Don”t you think they cover up our posters?” Shai sneered. “Well, it”s not right. Everyone in the whole world is ganging up on us. We should at least stick together.” “Look, stupid–” “Stop calling my sister stupid,” Rina shouted, and Tonia looked at her sister, surprised to have Rina stand up for her. “Put ours beside theirs,” Tonia said. “I bet a lot of people want to read both.” “And we don”t want them reading Irgun trash,” Shai said. “It”s supposed to be like a newspaper. People have a right to read whatever newspaper they want.” “Why do you care so much?” Rina asked her quietly. “Don”t you remember how sad Ima got when Hitler closed all the Jewish newspapers? She said that”s the real end of freedom. And I don”t know why Abba hates the Irgun so much. Don”t they bring boats full of Jews here?” “Yes, but–” “So how do you know it won”t be an Irgun boat that brings Ima”s family to Palestine?” Rina smiled and smoothed Tonia”s hair the way Ima often did, and Shai conceded. Tonia enjoyed the rest of that clandestine evening, her one disappointment being that no British soldiers turned up to chase after them. You know how you nag your kids? Watch out – they grow up and start nagging you right back. Sometimes it’s even worse than that. I found myself being scolded that just because I don’t enjoy doing something, that doesn’t mean I don’t have to do it. Not everything in life is fun. In a previous post I wrote about learning to take myself seriously as a writer. But at least that’s something I enjoy doing. 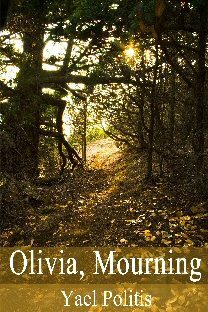 Then the minute I self-published the first two books of the Olivia series, my daughter started badgering me about taking myself more seriously as a publisher. Actually, stage one in the campaign to bulldoze me into learning to self-promote was mounted by Kathy, my friend since … forever. She’s the one who back in high school used to sigh and shake her head when I chose to stay home with my nose in a book, rather than accompany her to smoke-filled rooms booming with loud music. “You’re not on Facebook?!! Kathy said. “You’re publishing your own books and you’re not on Facebook. Are you nuts? There were like six hundred kids in our high school class. You should be friends with all of them.” She was fighting an uphill battle. I hadn’t changed. I used to be a real-life shut-in; now I was a digital one. But Kathy’s an irresistible force and just as I used to tag along with her in high school, I followed her onto Facebook. Lucky for me, it was fun, at least at first. A lot of my old school friends happened to be posting old pictures of us and the landmarks of our childhood. And she was right, old friends – including classmates whom I’m sure barely remember me – were incredibly supportive. They bought and reviewed books, were wonderful beta readers for Book 3, and helped me fact check. One even offered free editing. 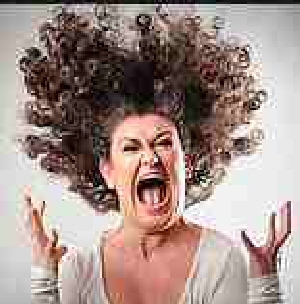 Another invited me to her home for a luncheon with her book club. So thanks, Kathy. And thanks old friends. Then I set up a blog. Not that there was a thing on earth I felt an urge to blog about. I just figured that if someone ever accidentally googled me, it probably wouldn’t be the best advertising to have the results page come up blank. So there, I thought, that’s it. Take out an ad on BookBub and I’m done. But the social media monster keeps rising out of the lake, dragging up another new platform that you just have to be on. Enough is enough. I wasn’t having any more of it. That was when my daughter stepped in as my new slave-master. “Ima, come on, you have to at least get a real website. That mess you made is a disaster. A catastrophe. Then you have to blog at least once a week. And you have to run ads on Facebook.” My head ached just thinking about it. But she’s another irresistible force, so I looked at a lot of author sites, chose design elements from a few of them, and worked with the developer my daughter hired for me. So here it is – this brand new website for me to blog on (which ain’t gonna happen once a week). But I’m glad she made me do that. Now she’s running ad campaigns for me on Facebook, going on about re-targeting, look-alike audiences, automated email – all things I can live happily without knowing they exist. We’ll see how that works out. It’s a struggle for me to embrace this choice. I’ve never enjoyed trying to sell anything – not Girl Scout cookies and not my own used cars. My typical sales pitch: “You don’t want to buy this, do you?” But, I remind myself, I did choose to offer books for sale. So, Yael, rah-rah, go all in, take it seriously, give it your best. You ain’t no J. D. Salinger and can’t afford to hide out. But on this one I’ve left myself an out. The social media stuff consumes too much time and I do believe that the best way to market books is to write more of them and make them better. So I’ll go back to trying to do that. Especially since I made a terrifically bad decision and tried to index my new website with Google and do some basic SEO for it. After all, for years I made my living as a technical writer and was quick to embrace new technologies. True, since retiring I have no patience for any of it. All I want my phone to do is ring when someone calls. But how hard can it be to index a site on Google? Peanuts. I spent a few hours reading up, logged into my site, entered a verification code I’d gotten off Google, entered some meta descriptions, updated an email address, entered some keywords. No biggee. Then I hit Update and waited to feel proud of myself. The fruits of my labors? The Home page disappeared. For no reason. It was just gone. Empty. Nothing I did could have made that happen. Honest. Talk about a panic attack. Not because I no longer had a Home page – but because my daughter was going to know. OMG. She’s going to kill me. Ever take the car keys away from your kids? My daughter changed the password on me. Locked me out of my own website. “You’re an editor. You can write blog posts and that’s all you can do. You’re never going anywhere near the back end again. Is that clear?” Hah. So there. The last place on earth I ever want to go again is the back end of a web site. I first read this book over a decade ago, but recently picked it up again, and again had trouble putting it down. Based on the author’s years of research into her own family’s history in a small community in Louisiana before, during, and after the Civil War, it takes an unblinking look at the complicated relationships between slaveholders (black and white), slaves, and free people of color, often focusing on white fathers and their mixed race children. It is extremely well-written and reads like a novel. Deserves to be rediscovered.